Awesome Amersham – The Art Attack Advances! Briefly, here are some more pics just in of the wonderful Tim and Black Tat art that students at Amersham School created for my visit there the other day. 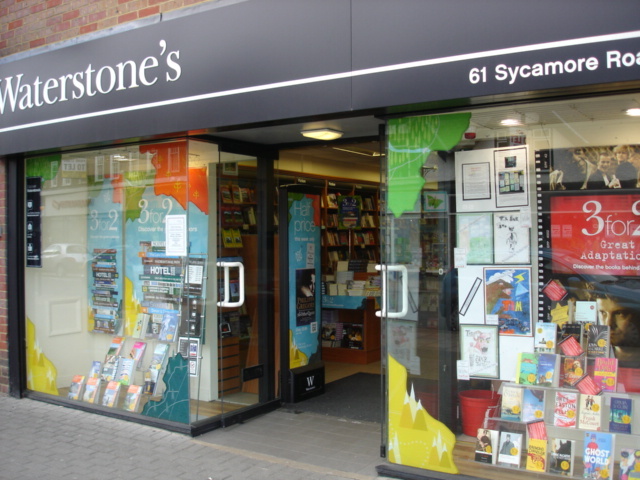 Their stunning work has gone up in a special display at the local branch of UK chain bookstore Waterstone’s! You see it there? Just to the right of the main entrance, in full view of EVERYBODY?? Another HUGE thank you to Amersham’s Year 8 students for their hospitality, and to Ms Shapland for sending me these pics. They have put an enormous cheesy grin on my face. Hee hee hee! Meanwhile, for more monster art of a medievally menacing kind, check Trapped By Monsters, here.